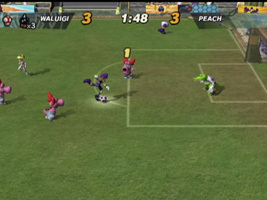 A soccer game for the GameCube starring Mario and friends. Select your team captain and put together a team of players. Each player comes with their own power shots. Kick the ball into the opponents goal to score. The player with the most goals when time runs out wins the game. By using power shots you can blast the ball around the pitch. Your team captain also has access to a Super Shot that scores two goals in one if successful. There are no referees, and an electric fence surrounds the pitch. The Veteran Cup features a NES Controller on top.